Most organizations today deploy network security tools that are built to perform limited prevention – traditionally “blocking and tackling” at the edge of a network using a firewall or by installing security software on every system. This is only one third of a security solution, and has become the least effective measure. The growing complexity of the IT infrastructure is the major challenge faced by existing network security tools. The major forces impacting current network security tools are the rising level of sophistication of cybercrimes, growing compliance and regulatory mandates, expanding virtualization of servers and the constant need for visibility compounded by ever-increasing data volumes. Larger networks involve enormous amounts of data, into which the incident teams must have a high degree of visibility for analysis and reporting purposes. An organization’s network and security teams are faced with increasing complexities, including network convergence, increased data and flow volumes, intensifying security threats, government compliance issues, rising costs and network performance demands. With network visibility and traceability also top priorities, companies must look to security network forensics to gain insight and uncover issues. The speed with which an organization can identify, diagnose, analyze, and respond to an incident will limit the damage and lower the cost of recovery. Analysts are better positioned to mitigate risk to the network and its data through security focused network forensics applied at the granular level. Only with sufficient granularity and historic visibility and tools that are able to machine learn from the network Big Data can the risk of an anomaly be properly diagnosed and mitigated. Doing so helps staff identify breaches that occur in real-time, as well as Insider threats and data leaks that take place over a prolonged period. Insider threats are one of the most difficult to detect and are missed by most security tools. Many network and security professionals assume that they can simply analyze data captured using their standard security devices like firewalls and intrusion detection systems, however they quickly discover limitations as these devices are not designed for and cannot record and report on every transaction due to lack of deep visibility, scalability and historic data retention making old fashioned network forensic reporting expensive and impractical. 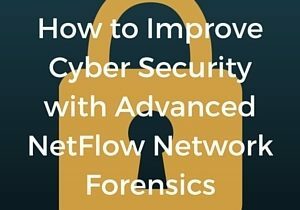 NetFlow is an analytics software technology that enables IT departments to accurately audit network data and host-level activity. It enhances network security and performance making it easy to identify suspicious user behaviors to protect your entire infrastructure. 24-7 automation, flexible reporting processes to deliver usable business intelligence and security forensics specifically for those analytics that can take a long time to produce. Further when integrated with a visual analytics process it will enable additional insights to the forensic professional when analyzing subsets of the flow data surrounding an event. In some ways it needs to act as a log analyzer, security information and event management (SIEM) and a network behavior anomaly and threat detector all rolled into one. The ultimate goal is to deploy a multi-faceted flow-analytics solution that can compliment your business by providing extreme visibility and eliminating network blindspots, both in your physical infrastructure and in the cloud, automatically detecting and diagnosing your entire network for anomalous traffic and improving your mean time to detect and repair.